Latest post Sat, Mar 31 2018 4:35 PM by jef. 26 replies. When trying to export on my laptop I'm getting very limited options for export codecs. Everything is up to date, but this is all I'm getting in the export Format settings, no Apple ProRes. The only thing I've found is it could be that I dont have Final Cut installed on this machine. Though I have Premiere installed and that has ProRes as an option. Any Ideas? Thanks! Filed under: Apple ProRes, MacBook Pro 13"
You're in the "Custom" QuickTime export dialog. You don't need to do that. By using that, you invoke the old, slow, 32-bit QuickTime process. Instead, you can use the "Same as Source" option, if you set your project's Render codec to ProRes in the Media Creation settings. By doing so, you'll cause Avid to render and export as ProRes for that project. Or, you can do a video mixdown, as ProRes, put that in a new sequence, and Same-as-Source export that. Doing a mixdown and exporting same as source worked. Still not sure why ProRes doesn't show up in the format optons for quicktime export, as it does on all my other machines, but this is how I'll do it from now on. On other machines, had you installed FCP or one of the Apple "pro apps" such as Compressor or Motion? That's generally how the QuickTime components for those formats get installed. In most cases yes, but we do have another desktop with no apple video apps installed and ProRes is an Avid export option. I then wondered if it was a setting on my laptop but both Premiere and Davinci have ProRes as export options. It has to be a setting buried in my avid settings or laptop settings, it seems. You could migrate the QuickTime ProRes codecs to that system as needed. I'm guessing they're not in the Library > QuickTime folder on your laptop. Yup, that did it. Though, the other desktop that does export ProRes also didnt have the ProRes codec in the quicktime library, so not sure where avid was pulling from on that machine. Maybe Sorensen Squeeze? Regardless, all good here. Thanks everyone for your help troubleshooting. Even if you get it to work, you still might consider the video mixdown with "same as source" option. Doing a direct Quicktime conversion export sometimes leads to the age-old unpredictable gamma issue on playback. You might have inconsistent results with playback in different players. For example, if I do a Quicktime export to ProRes, the same file will playback with data levels in VLC and video levels in Quicktime player. There are many threads in this forum on why and how. Thanks, thats the answer I was looking for. I've noticed many times the gamma issues when exporting to ProRes, now I know why. Download and install this codec package and you'll see all the ProRes options available in the Export pane, even with "Custom". Avid is using internal components to generate ProRes MXF. You needed ProRes QT files. Avid can generate this via Same as Source rewrap of MXF to QT. You cannot install Pro Video Formats directly if you don't have FCPx or Motion installed. You have to "open" the pkg and install manually. 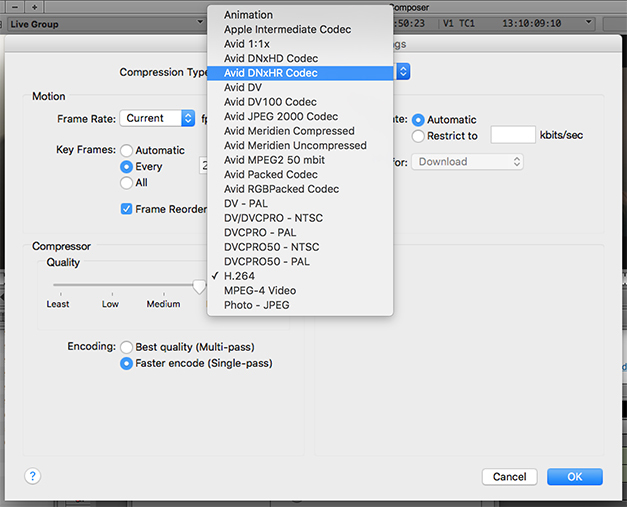 Setting the Render codec to ProRes did not make Avid export in ProRes. I got a DNxHD codec wrapped in QT. Many years ago I noticed that the "Same as Source" export is based on what the codec and resolution of the first shot in the sequence. It's as if Media Composer assumes that the entire sequence is in the same resolution and codec and qaulity as the first shot and takes that as a cue for the export quality. I used to place one frame of a title rendered in the highest quality possible at the time (this was back in SD times, so probably AVR77) and the resulting QT file would be in that resolution and quality and codec. I'll do a quick test to see if its still like that and let you all know. Test confirms my workflow from several years ago. First shot in sequence determines the output codec and quality when using "Same as Source". Is there a way to get anyoen from Avid in on this discussion? The correct workflow is to do a video mixdown to the desired codec, then export Same as Source, if that is a natively-supported option (like ProRes). That's asking Avid users to effectively export their sequence twice. Once as a mixdown, second as a ProRes file. Am I the only one seeing a problem with that? My sequence is 125 minutes long, what you're suggesting takes two hours of processing, when my method takes 28 minutes.